Once upon a time, Professor Harkness was a scholar researching early modern England in Oxford University’s Bodleian Library, when she – quite by accident – uncovered an apparently lost manuscript by none other than Dr John Dee. This moment clearly proved pivotal in her life, as some years later we meet the fictional Dr Diana Bishop, academic historian, researching sixteenth century alchemy in that very same library, when she comes across an unexpected book in response to a routine request to the archives. “The leather-bound volume was nothing remarkable. To an ordinary historian, it would have looked no different from hundreds of other manuscripts in Oxford’s Bodleian library, ancient and worn. But I knew there was something odd about it from the moment I collected it.” That odd, it turns out, is the book being heavily wrapped in a web of spells, enchanted to protect it from – what? Diana, a reluctant witch of New England descent, prefers science to magic and sends the book back whence it came to continue her studies in peace. But that manuscript, marked by the Bodleian as Ashmole 782, is set to change her life for good. The quiet summer library soon fills up with other creatures – witches like Diana, vampires and daemons – who seem to be waiting expectantly for her to do something. Most prominent amongst these is the eminent biochemistry scholar Professor Matthew Clairmont, himself a vampire, who quickly becomes Diana’s love interest. In this world hidden from humans, their love is considered forbidden under the terms of a covenant policed by the Congregation, a shadowy parliament of creatures established to govern their own kinds and keep their existence a secret. With Diana and Matthew hunted down as much for their relationship as for knowledge of the book she discovered that day in the Bodleian, Diana finally embraces her witchy self and they escape to the 1590s with the help of some hastily learned time-walking magic. There, they seek to find the manuscript that was to become Ashmole 782, hoping to get at it before it was damaged and enchanted at some unknown point in time. The Book of Life sees the pair return to the present, with Diana impossibly pregnant and more than the Congregation threatening their life together. Combining science, history and the Byzantine power politics of vampire families, the concluding part of the trilogy finally solves the mystery of Ashmole 782, and Diana and Matthew’s future. 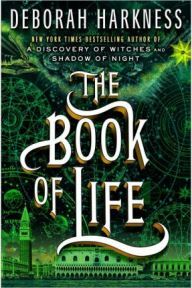 The research and writing in The Book of Life is what I have come to expect from Harkness – erudite, engaging and clever, using her academic knowledge to underpin a sweeping and increasingly complex tale. I find the writing has improved in fluency and ambition since the trilogy began, as she has grown in confidence as a writer of fiction (these are her first novels, following on from non-fiction writing from her job as a Professor). The Book of Life manages to handle an impressive roll-call of characters, a range of settings and explanations both historical and scientific with comfort, with my only niggle being the character of Benjamin, who was a bit of a underdeveloped baddie; I would have liked to know just a little more about what makes him tick to bring him to life as a rounded (if psychotic) character. Otherwise the breadth and scale of the work is impressive, and more than adequate explanation as to why we have had to wait two years for the release of this book. Which just leaves me considering the title. The first novel in the series was of course a clever play on notorious witch-finder Matthew Hopkins’ work The Discovery of Witches, while the second was undoubtedly a reference to the 1594 publication of the same name by poet George Chapman, a character who popped up in the novel as one of Matthew’s Elizabethan friends. So where does that leave us with The Book of Life? Perhaps it is a nod to the biblical Book of Life from Revelations, a reference to the creatures saved by Diana and Matthew’s adventures. Given that Matthew remains a catholic despite his undead existence, this would seem a fitting gesture for Harkness to make. I think I enjoyed Shadow of Night more than this book, but then I don’t hide the fact that I am a sucker for a good time travel story. The Book of Life was worth waiting for and comes highly recommended from me – just make sure you read the start of the trilogy first! With thanks to the publishers for the advance review copy of this book – and for the party where they distributed it. No Comments on "The Book of Life"